This Saturday at 10:30 AM at Sunnyside Mall, between Malden and Magnolia, GWNA will be sponsoring a li’l Halloween festival for the kids of the neighborhood. Your neighbor Kami Mclochlin is heading up the festivities and is wondering if anyone would be interested in donating some items (or a offering a few bucks to help us to buy them) or volunteering at an activity table. If you are interested, please contact Kami by clicking on this link and then clicking on the “Send Kami a Message” under her profile photo. Below is a list of some of the things we’d hoping to have donated, purchase or borrow. Thanks everyone, hope to see a big crowd out on Saturday morning! One small step for the Mall; one giant leap for the community. As you probably know, most of Sunnyside Mall is encompassed within the Graceland-Wilson Neighbors boundaries. One of the things we’d like to do as we rouse this block club from its slumber is to reinvigorate Sunnyside Mall. 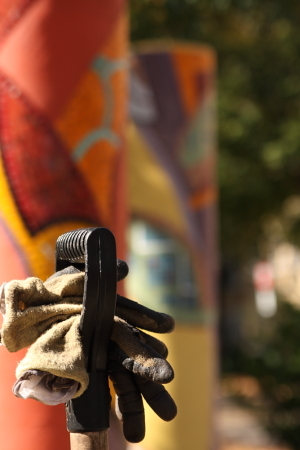 We plan to make it the centerpiece of the neighborhood rather than just the pass-through that it has become for many. Once upon a time, the Mall had better groomed gardens and ample people to care for it. But, over time, these guardians dwindled and the maintenance became difficult to manage. One of the first steps we wanted to take as a block club was to give some of those planters a spit shine. With Christy’s gift in hand, a small group of us spent a bit of time last Saturday planting and mulching. It’s like night and day right now… but it should really pop next Spring. Thanks again to Christy for the gift and to Katherine, Ron, Lyn Sue, Ken and Tom for getting their hands dirty. Also, special thanks to Tom for being the sole waterer at the Mall for many years previous to this. We hope this is just the beginning of many great things to come. 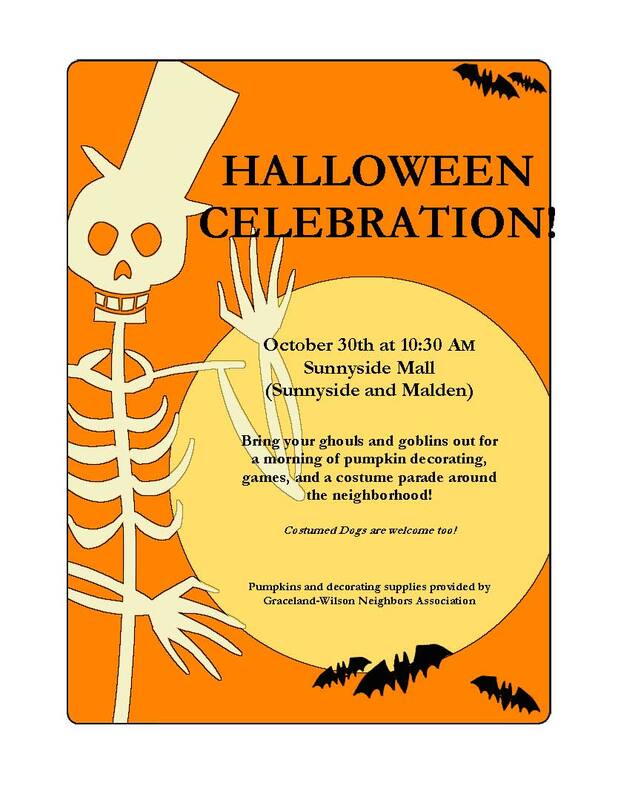 Though clearly not the best-named location for a spoooooky Halloween get together, please join your neighbors at Sunnyside Mall on 10/30 at 10:30 AM for a Kids Halloween Celebration. Dress up your kids in costume and bring ’em out to strut their stuff. We’ll have some games, pumpkin decorating, a short “parade” and, well, general mirth. Dogs (in or out of costume) are welcomed too. P.S. If you’d like to volunteer to help, please contact Kami McLochlin; she’ll appreciate any extra help she can get. Thanks. NOTE: We’re planning to have a Kids Halloween Celebration at Sunnyside Mall on Saturday 10/30 at 10:30 AM. Kids can dress up in their costumes and we’ll have some games, do some pumpkin decorating and then have a short parade around the neighborhood. Non-kids and pets are also invited to join in on the fun. If anyone wants to help with this (and we’d love some volunteers! ), please send Kami Mclochlin a note by clicking here. Thanks!